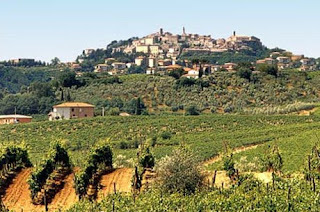 Montepulciano d’abruzzo is a favorite kosher wine of mine. It has medium full body, light tannins, and is fruity, and dry. Produced in the central region of Italy, Abruzzo, this varietal is different from Vino Nobile di Montepulciano, which is produced in and around the Renaissance town of Montepulciano in the province of Siena. Because the Abruzzo varietal ripens so early, it is not planted any further north than Central Italy. It is not usually aged for more than 2 years, and if it is, it becomes a riserva. Up to 10% Sangiovese grape is allowed to be blended. Vino Nobile di Montepulciano, is of the Sangiovese grape varietal. Coming from the Latin, sanguis Jovis, or “the blood of Jove,” it is usually aged in oak barrels for 2 years, or 3 if iti is a riserva. Similarly fruity, with blush tones of cherry, and stronger tannins, this wine has a long, pleasant aftertaste. This varietal is most famous for the Chianti blend in kosher wines, and it has flavors of red berry, although it can easily assume oaky, deeper flavors when aged. Well now that we have that Montepulciano dispute all cleared up, let’s go drink a bottle of kosher wine!